are close-in giant planets forcing the engine? Stars like the Sun host a spinning engine - their magnetic fields. 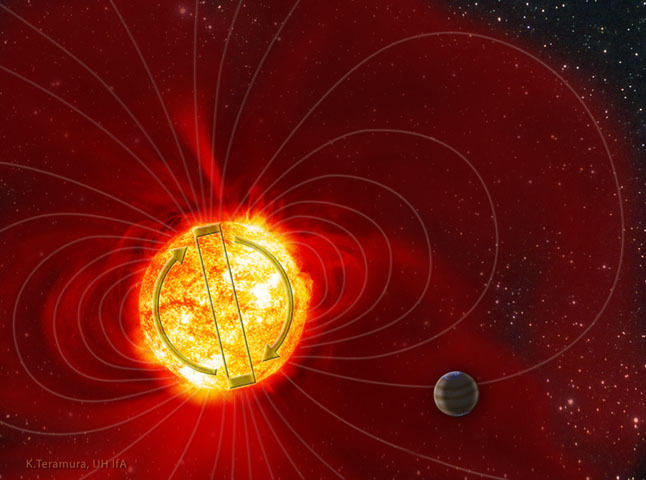 These magnetic fields are similar to those of bar magnets, except that they flip their north and south sides regularly, every 11 years in the case of the Sun. For the first time, an international team of astrophysicists1 has just caught one star other than the Sun - tau Bootis A - in the process of flipping its north and south magnetic poles. They however suspect that this event is much more frequent in tau Bootis A than in the Sun - is the magnetic engine in tau Bootis A spun up by the giant planet closely orbiting its host star? This discovery, published in the Monthly Notices of the Royal Astronomical Society, should help scientists understand better how magnetic engines work in stars like our Sun. Stars like the Sun are not quiet and steady - they host a complex engine producing a magnetic field very similar to that of a bar magnet. The solar corona, best visible during total eclipses, visualises this magnetic field just as iron filings would do for a bar magnet. The engine producing magnets of Sun-like stars is called a dynamo and uses both the spinning of stars and the boiling-like motions occuring below their surfaces. The Earth's magnet is also generated by a dynamo engine. An interesting and important property of the Sun's magnet is its ability to flip its north and south sides regularly, every 11 years: this is the magnetic cycle of the Sun, whose impact on the Earth climate is potentially strong enough to have caused the little ice age in the seventeen century. The Earth's magnet is also flipping side, though much less frequently and more eratically. Sun-like stars also host magnetic fields and their magnets are likely flipping side regularly as well; however, observing such events was difficult until now, as they could only be detected through indirect tracers, like for instance the very subtle brightness changes occuring at very specific colors. By looking directly at the magnetic fields of stars other than the Sun, an international team of astrophysicists1, led by JF Donati and C Moutou from CNRS (Toulouse and Marseille), has recently caught one star, called tau Bootis A, in the process of flipping its magnet, using twin instruments called ESPaDOnS2 on the Canada-France-Hawaii Telescope3 (atop MaunaKea in Hawaii) and NARVAL4 on the Télescope Bernard Lyot5 (atop pic du Midi en France). The magnetic arches they reconstruct for tau Bootis A are also fairly complex. 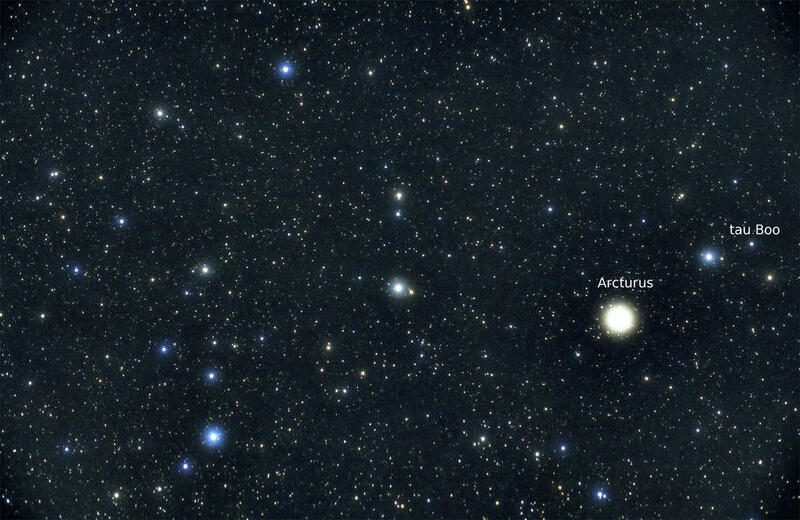 Slightly hotter and 20% more massive than the Sun, tau Bootis A is fairly bright and visible with the naked eye, being located only 51 light years away from us. What makes tau Bootis A even more interesting is that it harbours a giant planet orbiting very close to the surface of the star. The planet is actually so close to its host star and so massive - about 6.5 times more massive than Jupiter and orbiting at an altitude of only one twentieth the distance between the Sun and the Earth - that astronomers think it succeeded at forcing at least the surface of tau Bootis A to corotate with the planet orbital motion through tidal torques (the very effect that forced the Moon to corotate with its orbital motion around the Earth). If JF Donati, C Moutou and collaborators managed to catch tau Bootis A in this state of magnetic flipping, it is probably not just by chance. They suspect that this event is much more frequent in tau Bootis A than in the Sun - possibly every few years only as opposed to 11 years in the case of the Sun. Is the giant planet that already managed to speed up the surface of tau Bootis A, also spinning up the magnetic engine of its host star? Donati, Moutou and collaborators will undoubtedly keep their eyes tightly focussed on tau Bootis A in coming years to make sure not to miss any of the star's future regular magnetic turnover - with the hope of understanding better how magnetic engines work in stars like our Sun, and whether/how close-in giant planets manage to spin them up. ESPaDOnS was cofunded by France (CNRS/INSU, Ministère de la Recherche, LATT, Observatoire Midi-Pyrénées, Laboratoire d'Etudes Spatiales et d'Instrumentation en Astrophysique, Observatoire de Paris-Meudon), Canada (NSERC), CFHT and ESA (ESTEC/RSSD). First light occured on 2004 Sept 2. CFHT operation is funded by Canada (NRC/CNRC), France (CNRS/INSU) and the University of Hawaii. NARVAL was cofunded by the Région Midi-Pyrénées, the Ministère de la Recherche, the conseil Général des Hautes Pyrénées, the European Union (FEDER funds) and CNRS/INSU. First light occured on 2006 Nov 13. The Télescope Bernard Lyot (TBL) is funded by CNRS/INSU.